It’s just not true that foot pain is a normal consequence of growing older. In addition to healthy feet and ankles contributing to a full and active lifestyle, they can also help reduce a senior’s risk for dangerous and deadly falls. Falls have become the leading cause of injury deaths among Americans age 65 and older, according to the Centers for Disease Control and Prevention. 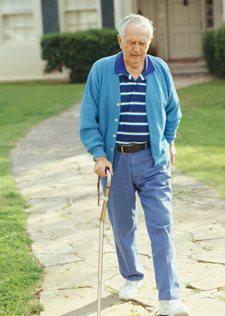 Painful foot conditions, such as osteoarthritis, corns, bunions, hammertoes and diabetes complications, can make it difficult for seniors to maintain balance and coordination when walking or standing. Lower-body weakness and gait and balance problems are frequently cited risk factors for falls among seniors. Exercises to enhance lower-body strength can reduce this risk. But for seniors with painful foot and ankle conditions, exercise can be difficult. Just one fall can permanently rob seniors of their independence and dramatically reduce their quality of life. Minimizing or eliminating foot pain in seniors improves their balance, coordination and stability when walking or standing. A foot and ankle surgeon can recommend simple, effective pain relief measures, such as stretching exercises or padding for painful corns and hammertoes. But when surgery is the most appropriate treatment for a senior’s painful feet, simple surgical techniques often allow treatment to be performed on an outpatient basis.